Google unveiled its answer to Amazon's Echo today, showing off an artificially intelligent assistant for the home that can be used to do everything from ask a question to calling up video content on your television. The uses presented by Google were just the beginning. Mario Queiroz, vice president of product management at Google, said today during the company's annual developer's conference that he expects the assistant, which appears shorter than Amazon's Echo, will be set up to allow users to do everything from ordering dinner to sending mom flowers. Called Google Home, the assistant isn't expected to be released until later this year, according to the company. However, it made its debut early so Google could begin working with more developers on creating experiences for the device, which also serves as a Wi-Fi enabled speaker. "It has search built in. It draws on 17 years of innovation in organizing the world's information to answer questions that are difficult for other assistants to handle," Queiroz said. 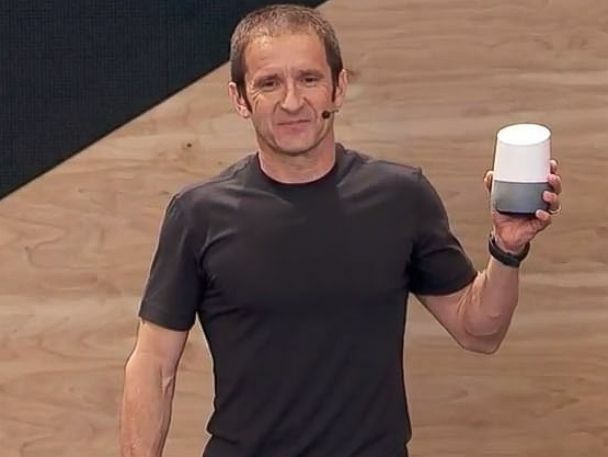 Mario Queiroz, vice president of product management at Google, holds the new Google Home assistant. During a demonstration of the AI technology, Google CEO Sundar Pichai showed off the assistant's ability to understand natural language. For instance, a person can ask "Who directed 'The Revenant?'" and learned it was Alejandro González Iñárritu. Without saying the director's name, they can follow up by asking, "Showing me his awards," and receive a list of the Academy Award winner's accolades. "We think of the assistant as an ambient experience that extends across devices," Pichai said today at the conference in Mountain View, California. He said he envisions the technology being in homes, cars and on devices. Google showed off the astounding strides it has made in artificial intelligence in March when its computer beat the human champion of "Go," taking four of five games in the series. While computers can now compete at the grand master level in chess, teaching a machine to win at Go is a huge achievement since the game has trillions of possible moves. It's estimated there are 10 to the power of 700 ways a game of Go could be played.